To improve lives and change community conditions through strategic and impactful services. To assist children in entering school ready to learn, engage in positive behavior and strive for academic achievement. To encourage behaviors that will lead to a healthier lifestyle. To make a lasting difference on the financial stability of individuals and families. What is United Way of Greater Niagara? Our Mission: To invest in programs that focus on Education, Health & Income that deliver measurable results to improve our community today and strengthen it for tomorrow. Our Vision: Greater Niagara is a vibrant region where all individuals and families achieve their potential through education, income stability and healthy lives. Sign Up and become a volunteer for the United Way of Greater Niagara! We are always in need for new people for volunteering in our events. Without the volunteers we already have, we would never be able to coordinate events like; Day of Caring and Make a Difference Day! 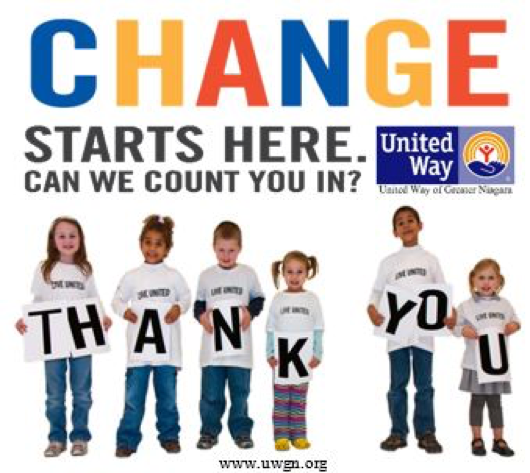 An easy and great way to support United Way is by providing coin banks for your customers to fill up with their extra change! Please contact us if you would like to place one of the coin banks at your business. Our year round drives are currently accepting donations. Please review the links below for information on each drive. "My name is Lydia* and I am a survivor of domestic violence. I lived in a domestic violence situation for 17 years. I did not think there would ever be any hope for me, or that I would ever make it out alive. With the help of the few strong amazing women in my life who believed in me. They linked me with Family and Children Services of Niagara’s domestic violence shelter Passage House. If you think that there is no hope, I am here to tell you there is a way out. Once for so long I was silent and now I am ready to speak." "My name is Kimberly, I am 42 years old. I am the mother of 5 beautiful children, and have been blessed with one grandchild. Carolyn’s House has a supportive housing program for homeless women and children run by the YWCA of the Niagara Frontier. After completing my stay at the halfway house, I had nowhere to go. I am proof that it is NEVER too late and you can always make the right change." "Literacy New York Buffalo-Niagara has been fortunate to have a family of dedicated volunteer tutors for the past 50 years, including volunteers like Chuck Curran. Chuck is an avid reader and active volunteer for a variety of community agencies. After retiring from a career in government social work, he joined LNYBN in 2013 and has been tutoring Constance Lansberry at the Niagara Falls Main Library ever since. " Literacy NY Buffalo - Niagara Inc.